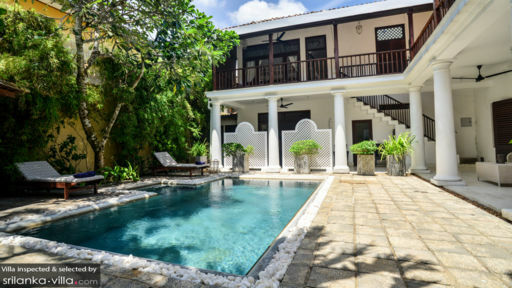 Set within the walls of the historical Galle Fort in the city of Galle, Villa 32 Middle Streets is a one of its kind holiday home that not only allows you to experience living inside walls that date back to 400 years but also provides modern amenities to make you comfortable. 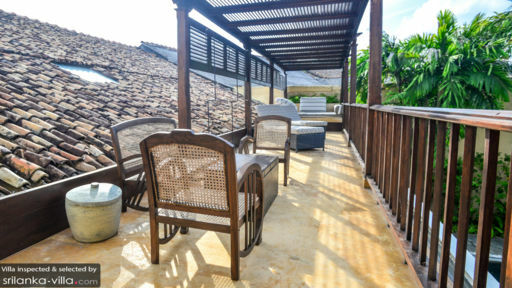 The three-bedroom villa is ideally situated close to Galle’s many sights including eateries, cafes, and Unawatuna beach. 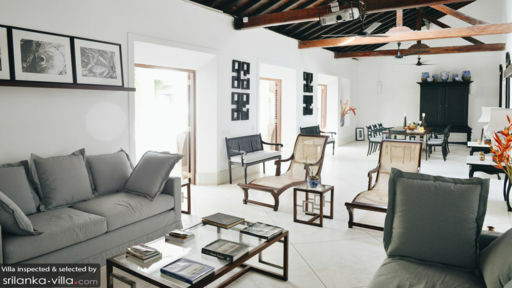 The villa reflects a colonial past so intrinsic to Sri Lankan history and you will find local elements such as teak wood and local artwork that dominate the spaces. There are three, well-appointed bedrooms at Villa 32 Middle Street with two suites that have two floors each and the third room which is the master bedroom. The bedrooms are air-conditioned and are furnished with personal seating areas. The first suite has the sitting area on the main level while the loft is furnished with a double bed and the second suite is similarly designed but with single beds in the loft. The master bedroom has its own alfresco sundeck with lounge to enjoy the panoramic views. All three bedrooms come with en-suite bathrooms fitted with necessary amenities. The courtyard is where all the action is owing to the free-size swimming pool resting under open skies. Surrounded by the sheer glory of the villa, the pool will become your new favourite haunt where you can spend hours idling away in bliss. There are rattan sun chairs, outdoor sets, lounge sofas on the veranda, as well as an alfresco dining area so you can make the most of the outdoors. The stunning living area at Villa 32 Middle Street is a feast for the eyes what with wooden trusses marking the ceiling, whitewashed walls adorned with selective artwork, white couches that sit facing a projector screen, and hints of canary yellow splashed across the room. Thanks to the louvered double doors, the room remains well-lit and ventilated for a refreshing and calm atmosphere. Ceiling fans keep the living room breezy and as you relax with loved ones. The colonial-inspired architecture lends a charming quality to the villa which is luxurious and aristocratic. Under the high-soaring ceiling just beside the seating also stands the dining area of the villa. When you’re in the mood for a more formal setup, enjoy your dinner at the six-seater dining table with comfortable chairs. The kitchen is another excellently-designed space with French doors that lead to the courtyard. An antique crockery unit stands against the wall and a cemented cupboard also holds a variety of ceramics. The fully-equipped kitchen is all you need to cook your meals and you can always request for a personal chef. The villa is fully-staffed complete with a villa chef who is all too happy to take requests for meals. There is housekeeping and maintenance all taken care of so you can enjoy yourself without a worry. Located in the centre of things, you have everything right at your doorstep from the historical sites in town to up and coming boutiques and shops. Visit the National Museum of Galle for a lesson in history or walk along Lighthouse Street for an amazing introduction to 17th-century Dutch architecture. We've been back at work now for about five weeks and all I can think about is the beautiful house at 32 Middle Street, Galle. The rustic front verandah with its wooden benches and palm trees, the pristine pool surrounded by tropical plants and trees. The spacious lounge and dining room, complete with leather chairs, mood lighting and shuttered doors. Bedrooms with gorgeous heavy wooden furniture, four poster beds and mosquito nets, air-conditioning for the hot nights and airy brushed concrete bathrooms. I could go on! Thanks so much to Kusal, our host, who made our stay so enjoyable. Kusal has been a chef for 15 years and cooked us a Sri Lankan feast on our final night. We even got a detailed cooking class as part of the package. Located right in the middle of the fort, 32 Middle Street is paradise. A quiet refuge in the busy heat of the colonial fort town. Right now, I'm planning my return to 32 Middle Street. We won't be the only ones. Many of the previous visitors have returned again and again. We will be back. Soon. We have stayed in villas all over the world, but 32 Middle street and its surrounds was our best vacation ever. The house is uncompromising in its stylish decor, comfort and quality. The staff discreet and professional. It was tempting to lounge in the pool and courtyards all day, enjoying delicious meals and napping on the massive outdoor daybed, but our forays to the beaches, ambles through the fort and sundowners on the ramparts all combined to create a stay that was perfect in every way. Agree with the last reviewer. A lovely oasis in the middle of Galle Fort. Classy and beautifully decorated. Stunning courtyard and friendly and helpful staff. Don't be fooled by the unloved look of the building outside when you approach, as soon as you get inside everything is perfect. If you are afraid of heights you won't like two of the bedrooms though as you need to climb a narrow set of spiral stairs to get into bed. Lush garden, infinity pool, great food, fabulous art on the walls with all the modern comfort in a fabulous historical house... we stayed there for a week in February and were sad to leave. We can only highly recommended the villa to those seeking the hard-to-get peaceful harmony of vacation in style.